Summer hours 8:30 a.m.- 8 p.m.
Back in the late 1960s and early 1970s, when my then-partner Peter Yronwode and i travelled the back roads of America, we often saw signs painted on the sides and roofs of barns that advertised Rock City, a roadside attraction built on top of Lookout Mountain, overlooking Chattanooga, Tennessee. The signs lured us with enticingly cryptic messages like "Stay on U.S. 41 and See Rock City!" "See Seven States From Atop Lookout Mt.!" and "When You See Rock City You See the Best!" -- but we never actually went there. After a while, we learned that a friend of ours, Barrance C. Lespine, had also travelled the South and was likewise fascinated by the Rock City advertising signs. He never went there either. -- which kind of summed up our almost 30 years of fantasizng about the place. 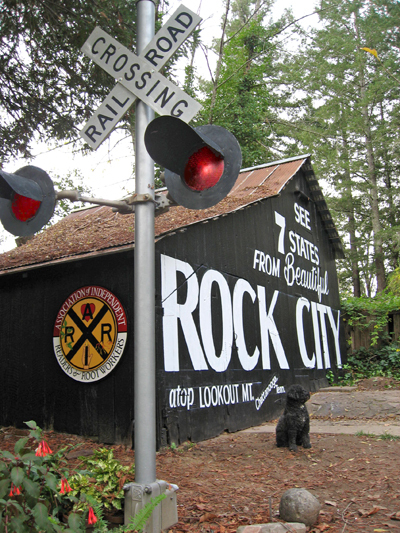 Rock City -- the concept of a home-built theme park atop a sacred mountain, not the actual site, which i still have never seen -- fueled my personal interest in vernacular architecture of the "roadside attraction" type. I have collected literature and postcards on these places for years, and have visited as many as i could, but i have rarely discussed my interest in this sort of thing with anyone but Barry and another friend, Fred Burke. Some academic attention has been paid to the phenomenon of home-made sacred sites (especially to the influence of the Dickeyville Grotto in Wisconsin on what is academically termed the "Upper Midwest Concrete Grotto Environment") -- and a couple of popular books have touched on the best known examples, but i know of no pictorial survey of these sites per se. "All Their Own," written in 1977 and now out of print, is the only book i have that presents clear, archival photos of both Dickeyville and S. P. Dinsmoor's Garden of Eden in Lucas, Kansas -- but the volume deals mostly with small oddball homes (bottle houses and the like), not with sacred or didactic sites -- and the "meaning" behind the works is given short shrift in favour of delighting in their oddity. "California Crazy," "The Well Built Elephant," and "Ducks and Diners" are three 1980s books that illustrate the charming commercial "emblematic" architecture of the early to mid 20th century in which the form of a building is determined by its use (e.g. a teapot shaped restaurant and a shoe shaped shoe repair shop) -- but as the sites are commercial ventures, there is little or no religious, spiritual, or didactic content to their architectural layout. A few non-vernacular but nonetheless oddball sacred sites created by wealthy people, such as the Singing Tower in Lake Wales, Florida, and Bellingrath Gardens in Mobile, Alabama, have been the subject of their own books or pamphlets, but most of these sites are more stately than wacky, and in any case the publications describing them are long out of print. Both the book "Roadside America" and the web site it spawned contain a lot of fun information about roadside attractions, but there is a tongue-in-cheek quality to the suthors' presentation that does not serve vernacular sacred sites as well as it does commercial roadside architecture. In 1997, the photographer David Jenkins, with the help of the 81-year old retired Rock City sign painter Clark Byers, assembled a beautiful documentary book on the fast-fading splendour of Rock City's barn signage. 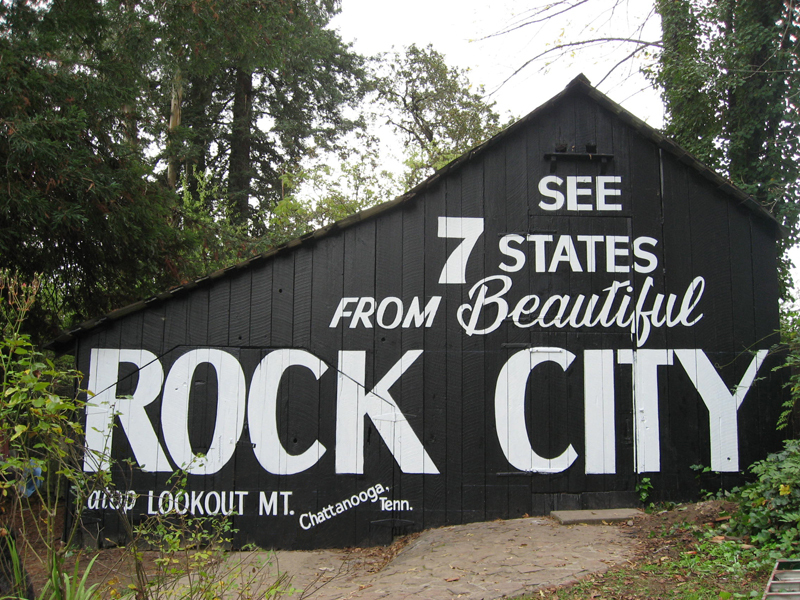 Of the more than 700 barns in Ohio, Alabama, Tennessee, North Carolina, Kentucky, Georgia, and Louisiana that Byers and his crew had once kept painted with those signs, only 250 remained standing in 1994 when the photography project began -- and of those, only 85 were still being regularly repainted by Rock City employees. 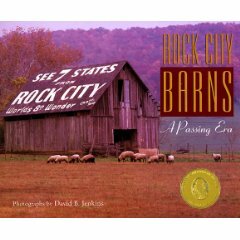 Jenkins' gorgeous book, "Rock City Barns: A Passing Era" is an important testament to the cultural role of vernauclar sacred sites in America. Rock City was not conceived as a sacred site, but in scope, placement, and execution it transcends the small commerical "emblematic" buildings and home-sized oddball vernacular architecture with which it is sometimes classed. It is a roadside attraction, but its placement on the landscape gives it something that might be called "natural feng shui goodness" -- which most such sites lack. It straddles the gulf between "theme park," "outsider art" and "earth mystery" -- and thus it holds more interest to me than its status as "a tourist attraction" would otherwise imply. But then, i am a rather oddball person myself. The fence posts on my long driveway are decorated with abalone shells. The fence posts on my vegetable garden are decorated with horseshoes. In 1996, i commissioned a stone carver to engrave a big river rock with the words "Et in Arcadia Ego" and i set it up in my flower garden. Rock City means a lot to me, not for what it is, but for what it reminds me of about my own as-yet unaccomplished hopes and dreams. I live on two acres in Northern California at present and do not have the room to undertake a large building project, but i am blessed with the love and co-operation of nagasiva yronwode, a similarly-inclined companion, and together, stone by stone, he and i are building a little Rock City of our very own. We call it Arkaotika, and its motto is "Et in Arcadia Ego." In 2009, to celebrate ten years of wedded bliss, nagasiva and i hired the inspired sign painter and political activist Lenny Weinstein of Don Quixote Artworks in Monte Rio, California, to paint our old barn, which was built in 1875, with the SEE ROCK CITY message. As far as we know, it is the only See Rock City barn west of the Rockies. Yes, folks, the See Rock City barn on this page is not an old Tennessee relic. 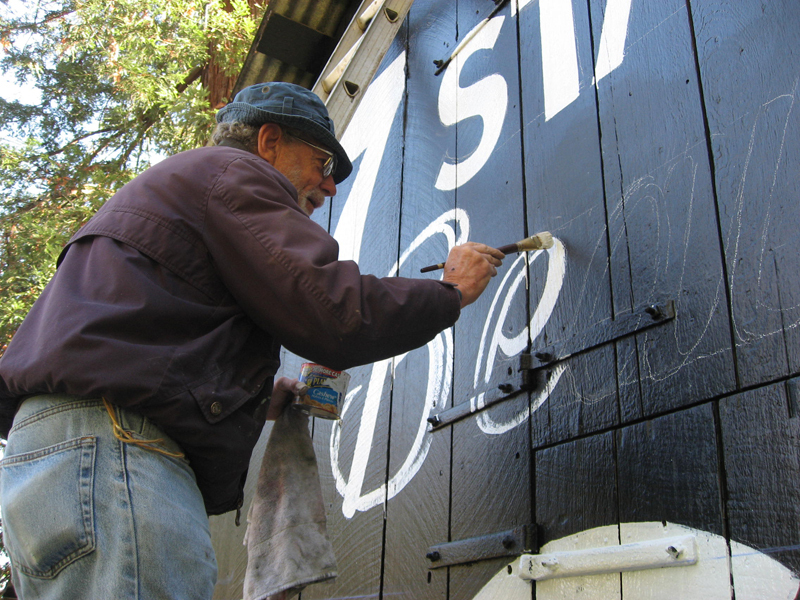 It is our barn, on our own land, in Forestville, California, painted by Lenny Weinstein, shown here lettering the word "Beautiful," which his work certainly is. If you can't make it to Rock City, you can always come see us.